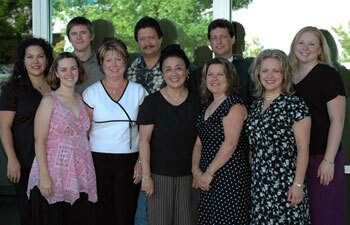 Pictured with GEO&JEM Inc. staff are founders Georgia O'Mary and Janie Millican, third and fourth from left, front row. Diving headlong into a business idea is one of the most important decisions for any up-and-coming entrepreneur. For some, the process of building a business venture can be more rewarding and profitable with a business partner who complements one’s skill sets and tolerance for risk. As co-founders of GEO & JEM, Inc. and Indian Country Interior Solutions, Janie and Georgia have taken their years of experience working in the furniture sales industry to establish joint-venture companies. Founded in 1994, GEO & JEM, Inc. is a full-spectrum contract furniture dealership, specializing in providing services for corporate offices, hotels and casinos. Indian Country Interior Solutions was established as a subsidiary of GEO & JEM in 2005, and offers specialized space planning, interior design and furniture installation services for tribal enterprises across the nation. "Both businesses are 100% woman-owned. We have diverse offerings to many industries,” said Janie, who is a tribal member of the Muscogee Creek Nation in Oklahoma, and president of the Oregon Native American Chamber of Commerce. Her business partner, Georgia, is of Japanese descent. Leveraging their expertise and experience in the furniture industry, the two close friends decided to start their own business. “We both have tremendous experience in the industry – working our way up and making great connections with clients. We both had a really good reputation among our peers and knew the business very well. We both felt confident that we could make it work,” said Janie. It also helped that Janie and Georgia had complementary skills and shared the same vision toward growing the company. Janie and Georgia are hands-on and detail-oriented project managers who work closely alongside their clients to ensure that the job is done right. GEO & JEM had its humble beginnings in the women’s homes. Building capacity is one of the biggest hurdles they overcame during the first year of being in business. “We started out with only a small line of credit. As we got more clients on-board, we needed to expand our capacity so we can continue growing the business,” Janie said. Making important decisions about the wayforward of the company requires thoughtful consideration. “Sometimes, we had different ideas about how a decision should be made. We’ve found that if we both sit down and talk it through together, we usually end up with a pretty good decision,” she said. Personal attention, keen focus on detail and the ability to “listen” to what clients want are key to GEO & JEM’s success. In time, owners expanded GEO & JEM services to deliver more specialized services to Indian country clients – delivering the highest level of service and practical advice. Their clients include some of the largest names in the Indian country hospitality business, as well as hospitals and health care institutions in the Pacific Northwest. Janie and Georgia have assembled a highly-skilled team of internal account support specialists with expertise in CAD, space planning, interior design and project management. For Janie, an important component of their success is leveraging cultural tenets of respect and honesty. "Respect for others – customers, employees, friends, and family – has always been really important. Native people are more on the quiet side, more reserved, and more apt to listen and be in tune with other people’s needs. That has really helped me with doing business – whether with commercial clients or in Indian country,” said Janie. Loyal and dedicated employees have been crucial to the companies’ success. “Georgia and I have always felt that it doesn’t matter what position you hold in the company, you’re the same as everybody else here,” she said. “There’s no hierarchy. We always have our doors open. If there are personal or family problems, we understand that our staff needs to take care of those issues. Family comes first. Janie and Georgia are united in their vision for the company: sustainable growth. “Our path is a good path. It’s been very rewarding,” said Janie.